Retractable Awnings & Custom Solutions - Get custom awnings in Los Angeles | Van Nuys Awning Co.
Are you looking to add that extra something to your home or business? A retractable awning from the Van Nuys Awning Co.® in Los Angeles is the perfect way to provide both protection and aesthetics to your business, pool area, or house. 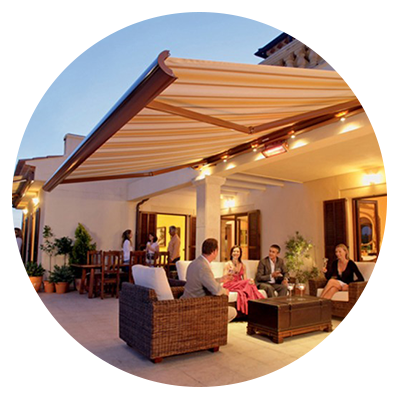 Contact the Van Nuys Awning Co. today to get your free quote and get started on your custom retractable awning. Your new custom retractable patio awning is just a phone call away. Whether you’re a business owner looking for a way to provide shade and protection for your customers, or you’re a homeowner that’s looking for that custom feature that will perfectly tie your backyard together, a custom retractable awning from the Van Nuys Awning Co. is perfect for you. Contact Van Nuys today to get more information and get a free quote for your next project, or keep reading to see how a custom awning can benefit your business or backyard. Retractable awning from the Van Nuys Awning Co. offer your customers and guests shade and protection from the elements. However, unlike their fixed counterparts, retractable awnings can also be moved to allow more sun in, giving your patrons the perfect choice while they’re at your establishment. You can also customize your awning with your choice of materials, colors, and your company’s logo. Custom retractable awning can provide many benefits for your home. Not only do you get shade and protection from the elements, but a retractable awning can also help lower energy costs. Customize your Van Nuys awning with your choice of materials and fabrics and make your home the talk of the neighborhood. Get your custom awning from the Van Nuys Awning Co. Whether you’re a business looking to draw in customers, or a homeowner that wants to bring in neighbors for barbeques, a retractable awning from the Van Nuys Awning Co. is perfect for you. Contact Van Nuys today to get your free quote.